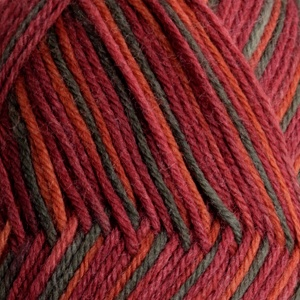 Knit Up & Dye Podcast, Yarn & Knitting Patterns: New Pattern Coming... A Shawl!! I'm currently test knitting a new pattern for release - my first shawl design. I'll have pictures for everyone just as soon as it is done. Again, I've taken inspiration from my love of Harry Potter and all things Magical and based this pattern on high wizard fashion, incorporating the look of dragon scales into the lace pattern. I'm using KnitPicks Stroll (superwash sock weight) in Tuscany Multi - a truly gorgeous combination of dark reds, with burnt orange/terracotta and deep green accents. Wonderful yarn to knit with at a fabulous price!